Xiaomi crowdfunding Mijia to launch 120 inches Hi-Res Projector. Home Uncategorized Xiaomi crowdfunding Mijia to launch 120 inches Hi-Res Projector. Xiaomi crowdfunding Mijia is now planning to launch its very first 120 inches Hi-Res Projector in China as per leaks. 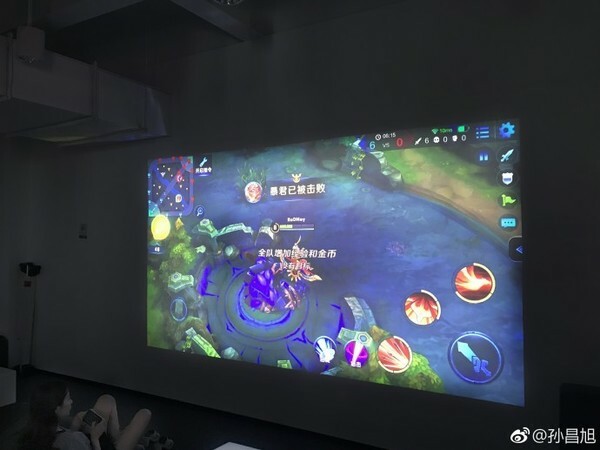 From the above image provided by the source, we can see the projected image which is having a wide span and is very High-Resolution picture produced on the wall.According to the analyst, Sun Changxu hs hinted this could be a wide screen projector. If theses rumours are true then Xiaomi will be entering the Projector markets soon.Xiaomi will provide tough competition to Sony new line up of Hi-Res projectors. If the projector launched then will be priced similarly to Xiaomi TVs. As of now, there are no details regarding the same, we have to take this news with a pinch of salt. We have to wait for few more weeks for more details. OnePlus 7 & OnePlus 6T 5G case renders surfaces online might launch soon. Xiaomi Mi 9 press renders and camera samples leaked online, Redmi Note 7 to land in India on Feb 28.